Shane Duggan produced the golden touch to give Limerick the most valuable of SSE Airtricity League Premier Division wins as they overcame Bray Wanderers 1-0 at the Carlisle Grounds on Friday night, to move up to eighth in the table. 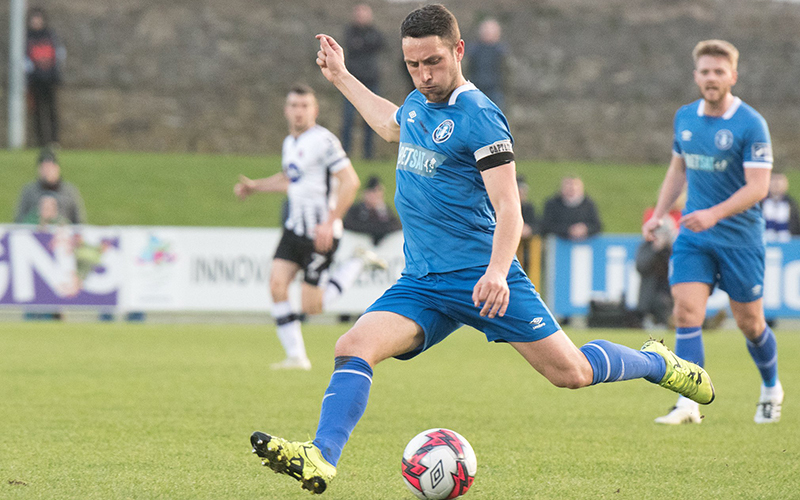 It would be the final five minutes of the first half before the most noteworthy action took place, with Gary McCabe blazing a penalty over before Kevin Lynch hit a free-kick off the crossbar as the hosts threatened. The Shannonsiders’ best chance of the period arrived seconds before the interval when Billy Dennehy’s cross found the run of Danny Morrissey in the centre but he scooped his shot over the bar. Limerick broke the deadlock early in the second half when Will Fitzgerald used his long throw-in to great effect, with Duggan doing well in the box as he twisted and turned before planting the ball in the bottom corner. Bray did push hard for an equaliser and almost found it two minutes from time but Lynch again hit the top of the woodwork, as Limerick held on for a precious three points. Limerick manager Tommy Barrett made three changes to the team that drew at Shamrock Rovers seven days earlier, as Connor Ellis (groin), Darren Dennehy (ankle) and Cían Coleman (suspended) were replaced by Shaun Kelly, Eoin Wearen – starting a first league game in nine – and Shane Tracy. The Blues also remained without Daniel Kearns (quad) while Mark O’Sullivan (shoulder) was only fit enough for a space on the bench. However, Conor Clifford recovered sufficiently to start having been forced off with a first-half knee injury against the Hoops. International winger Henry Cameron also came back into the matchday squad. Limerick had an opening inside two minutes when Wearen robbed possession deep in the Bray half and decided to take it on himself, his effort blocked behind – the first of five corners that they earned in the first half. While Will Fitzgerald was lively down the left wing, Bray grew into the game and saw plenty of the ball without threatening Brendan Clarke. Morrissey and Kilian Cantwell both headed off target, before McCabe sent in a corner for the home side which flashed across goal, Daniel Kelly unable to divert it goalwards after it arrived at him quickly at the back post. All the action arrived at the end of the half. On 40 minutes, Bray were awarded a penalty when Cory Galvin went on a mazy run and was taken down in the box by Dennehy. However, McCabe skied the spot-kick well over the bar. Then Lynch struck a free-kick from the edge of the area off the top of the crossbar, before Limerick should have been ahead right on the 45. Captain Shane Duggan did well to skip by his man and play it to Dennehy whose in-swinging delivery from the right was clipped over by Morrissey in the centre as he stretched for it. At the break, Kelly was forced off with a knee injury which had troubled him earlier in the week after hurting it in training. He was replaced by Tony Whitehead, with Cantwell moving to right-back. Limerick started the second half brightly and they had the lead on 50 minutes when Fitzgerald provided the long throw-in which caused problems for the Bray defence and, as they failed to clear, Duggan controlled well and shot to the bottom corner. On 65 minutes, Killian Brouder almost diverted a dangerous low cross into his own net but Clarke got across to save on the line. With ten minutes remaining Limerick survived a scare when Ronan Coughlan headed narrowly wide. At the other end, the visitors still posed a threat going forward, with Duggan driving just over while substitute Barry Maguire saw his free-kick headed over by Morrissey from close range. Late on, Bray hit the woodwork again and once more it was Lynch as, after a corner was palmed to him by Clarke, he let fly from 15-yards and it hit the top of the bar and flew over. But Limerick held on for a vital victory. Bray Wanderers: Aaron Dillon, Hugh Douglas, Conor Kenna, Dan McKenna, Kevin Lynch, Rhys Gorman (Ger Pender 63), Paul O’Conor, Gary McCabe ©, Daniel Kelly (Seán Heaney 88), Cory Galvin, Ronan Coughlan. Booked: None. Unused Subs: Evan Moran (GK), Shane Flynn, Dylan Hayes, Andy McGovern, Calvin Rogers. Limerick: Brendan Clarke, Shaun Kelly (Tony Whitehead HT), Killian Brouder, Kilian Cantwell, Shane Tracy (Colm Walsh-O’Loghlen 71), Will Fitzgerald, Eoin Wearen, Conor Clifford (Barry Maguire 80), Billy Dennehy, Shane Duggan ©, Danny Morrissey. Goal: S Duggan (50). Booked: E Wearen (28), C Clifford (38). Unused Subs: Tommy Holland (GK), Henry Cameron, Mark O’Sullivan, Adam Foley. Referee: Paul McLaughlin (Donegal). Attendance: 470.